What are you looking for/particularly interested in? What should people contact you for? 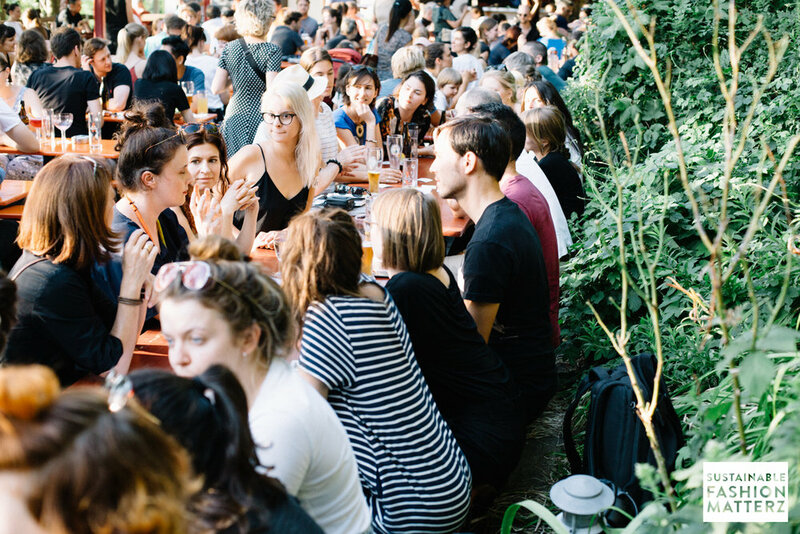 These are the questions we use as the foundation of our networking events. 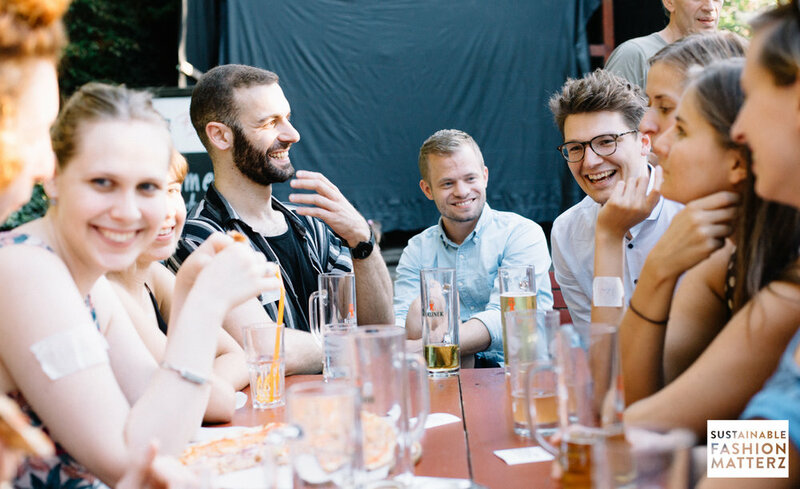 Together with Textilstammtisch Berlin, which organizes monthly events regarding the textile industry, we hosted a casual mid-summer meetup in Berlin, and have some new personalities with solution focused businesses and ideas we would like to introduce to you. I am the co-founder of Green Fashion Tours and Circular Economy Tours. With these two projects we bring interested people, designers and professionals on a sustainable journey, meeting designers, entrepreneurs and start-ups from different fields. We believe that human connection is the best way to to inform, while exchanging information, ideas, and finding solutions to move forward in the global fashion industry. Beside the guided tours, Green Fashion Tours offers 1-5 days full-immersion experiences for groups of students and professionals, who want to deepen specific knowledge and learn how to create innovation in a sustainable way. I'm also a founding member of the non-profit organization Future Fashion Forward e.V. we develop education programs for schools & universities, we coordinate the Fashion Revolution campaign in Germany and co-organize the Textilstammtisch Berlin. I'm always looking for new stores & labels with a sustainable philosophy behind to visit on our tours in Berlin. I´m also very open for cooperation requests and would love to extend our partner network. People can always contact us to know more about the german sustainable fashion scene, but in particular I would love to hear from you: if you have a cool cooperation idea in mind, if you want to take part in one of our tours or need our maps, if you are interested in helping us out with our mission! Any further recommendations for our readers? If you are interested in sustainable fashion, I strongly recommend you to sign up for our Future Fashion Forward newsletter & to sign in the Facebook group „Textilstammtisch Berin“, where you can get all the news from the green fashion community in Berlin. If you live in Berlin or in Munich I also recommend you to get one of our free Green Fashion Tours Maps, so that you always know where to go to shop sustainable fashion! I am the founder of circular.fashion where we developed a platform with tools for each stakeholder to help the fashion industry collaborate toward a more “closed loop” way of creating, using and recycling clothes — where garments, fabrics and fibres remain in use and never become waste. For fashion brands we offer sustainable design workshops and a Circular Design Software to help them design garments that can be fully recycled. It includes a material database, design guidelines and a product check to make sure a garment meets the requirements of textile recyclers. When a garment passes the product check, it receives a circularity.ID — an identification tag that can be sewn directly onto it. By scanning the tag, customers can find the garment’s full history, ideas on how to prolong its life and recycling instructions. At the end of a garment’s life, the circularity.ID tag can help textile sorters identify the material and find the right recycler to turn the garment into new fibres. We are always keen on co-developing collections with fashion brands that are strongly committed to sustainability. We offer individual and group workshops on a regular basis and currently invite designers and brands to join our upcoming pilot phase: Get a sneak peek in our design software, test it and support collaboratively the further development! Circularity has become an industry buzz word with little knowledge of its actual meaning or solutions for implementation. Everyone who is interested to learn how to move from hype to real business, what is it that makes fabrics and products recyclable, how to incorporate circular design strategies in a way that they correspond successful to a circular business model - just contact us and let us shape your own strategy individually tailored to your brand. I'm representing GOTS (Global Organic Textile Standard) for the German speaking markets. I consults brands, retailers and producers on the sustainability benefits of the standard as well as make to make GOTS visible in press. In the past years I have been engaged in the Partnership of Sustainable Textiles to represent GOTS interests and fight, it was indeed a fight, for a more sustainable textile supply chain on a policy level. GOTS is the world’s leading processing standard for textiles made from organic fibers which covers the entire textile supply chain and sets out environmental and social (ILO core norms) criteria. We work with independent Third Party Certifications for onsite audits and runs entirely non-profit. I absolutely believe in the power of connecting the sustainable fashion community. I would like to learn more about circular economy solutions as well as logistical solutions to prevent textile waste in manufacturing processes and other supply chain hot spots. Furthermore I am super interested in exploring innovative uses of natural fibers as well as to understand what it takes to “transition” more farmers to organic agriculture as I am convinced that it is one of the very few truly sustainable options of agricultural land use. I have a solid knowledge on a variety of topics related to the sustainable textile/fashion industry, obviously all questions regarding GOTS, risk management tools in general, relevant stakeholders in the industry, am often invited to speak on panels or give interviews for blogs/press. I also enjoy an exchange and hear about people’s current projects and brainstorm solutions to current challenges they might face. Have you got some media recommendations for our readers? I love Conscious Chatter, which is a super informative podcast on the topics of sustainable fashion. I often declutter Newsletter subscriptions but one I really enjoy is by GoBLue Team blog. I’m a fashion designer and accessories buyer (portfolio) originally from Australia with Italian heritage. Having designed for an iconic Australian womenswear label, I recently relocated to Berlin earlier this year to immerse myself in the European scene. I have a curious mind for all things creative and having spent 10+ years working in the Australian fashion scene, I’m now looking for exciting new collaborations and opportunities within the EU. I have a great interest in the sustainable fashion movement and in particular, new textile technologies and ways in which designers can be more accountable for what we produce. All things fashion! From technical design, product and concept development, textiles and garment construction, through to sketching and illustration. I’m more than happy to meet with like-minded people and discuss inspiring ideas they are currently exploring. JOIN US FOR MORE EVENTS! For more events stay up to date on our Facebook page, where we share all sustainable fashion events we come across, as well our own which you can find on the website in the Network-Events section. Our next planned event is in September and you can find all the details to register here.